Like his friends and colleagues Richard Long and Hamish Fulton, Ackling belongs to the generation of artists who graduated from St Martin's School of Art in the 1960s with a sense of the possibility of taking art out of the studio. 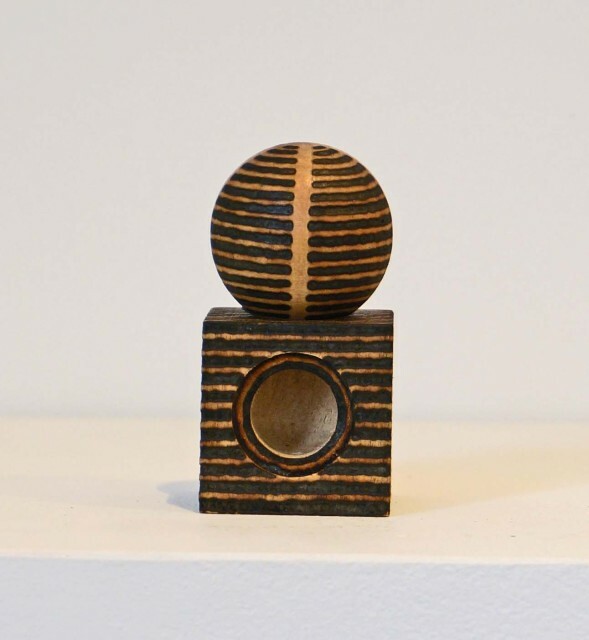 Sculpture, they decided, could be anything they wanted it to be: a walk though the Cairngorms, a bicycle ride through France, or in Ackling's case, a small piece of found wood marked by the sun. For the past 35 years, Ackling made all of his work by the same method: focusing sunlight through a hand held magnifying glass to draw onto pieces of discarded wood or scraps of card which he rescues from the edges of our everyday lives. It is an intense and meditative process; each mark, like a tiny sun, measuring the existence of a ray of light on its passage to earth from a source many millions of miles away. The resulting works have a weight and strength and sombre stillness which belies their often small scale and everyday origins. They have the power to transform the environment that they inhabit: making quiet interventions that subtly alter the space around them. Ackling's work urges a renewed awareness of the small, the silent, the marginal, the overlooked.